The "Last Name Search" doesn't require the complete spelling of the last name. The more letters entered in the search box will narrow the returned list of names. For example: To get a list of outstanding criminal warrants where the last name start with "P" enter the letter "P" in the search box. 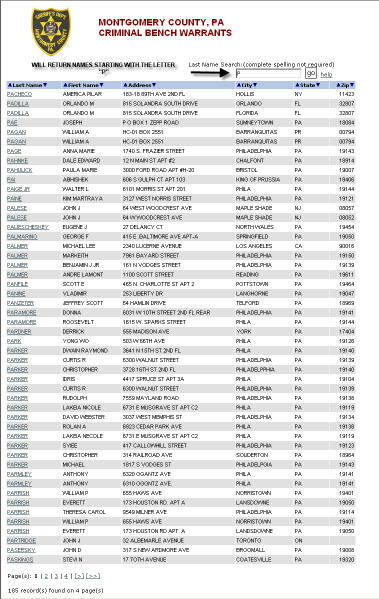 The return list of names can be viewed in a ascending or descending order either by Last Name, First Name, Address, City, State, or Zip Code. Click on the either the up or down images next to one of the column names. 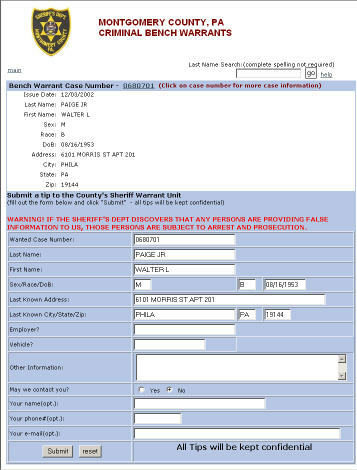 To view detail information about the warrant and have the opportunity to submit an E-Tip to the Sheriff's department leading to the whereabouts of this felon click on the person's last name. All tips submitted will be kept confidential. Any information that you can provide leading to the where about of these persons is helping Montgomery County to be a better community.